It is the year 2014. Take note of the times we are in, because they are special. This era will go down in the history books as an entrepreneurial renaissance. More than ever, new businesses are being built. I believe this is brought on by a combination of economic climate and accessibility. Whatever the case is, it’s AMAZING. Hard work and intellect are being celebrated and, more than ever, popularity is measured by a keen mix of smarts and ability to execute. No offence to Snookie, by I for one am ecstatic for this rapid change in culture. We need it. Collegiate programs are shifting focus to be more entrepreneurialism-based. As the culture changes, education platforms around it will continue to change as well as new programs that embrace networking, exposure, and collaboration. It is with this in mind that I am proud to announce a new program that has been inspired by AlleyNYC’s partnership with Entrepreneur Media. Announcing Entrepreneur Factory, a program that helps early-stage companies by providing subsidized office space along with media coverage of each and every sponsored organization. Together, we will be working with colleges, incubators, accelerators, and entrepreneurial programs around the world. We have selected three organizations to be part of the inaugural launch of this program: Cornell University-funded Data Incubator, Kaplan Accelerator, powered by TechStars, and the Startup Leadership Program. Everyone is very jazzed about the potential. It is programs like this that make my job the best job in the world. To have the ability to help foster the growth of these young companies is something that I feel is extremely special. We will be working diligently on creating new, valuable experiences. And we will be doing so with our partners at Entrepreneur Media. 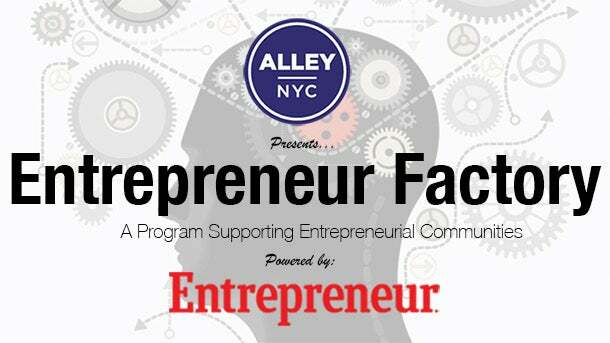 Entrepreneur Factory will welcome early stage companies into the AlleyNYC family and expose members to our programing plus strategic media exposure. Look for more updates and coverage in the weeks to come. Hustle ON.